Cable-Style: For both A-arm and strut front suspensions, this 7-position adjuster enables fine tuning of front-end separation to improve vehicle reaction. Cable assemblies, weld-on tabs, hardware included. Bolt-On: This limiter is designed for race cars with factory upper A-arm suspensions. 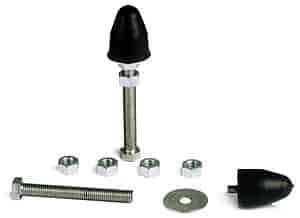 It installs easily by removing the factory upper snubber and threading the adjuster bolt through the stock hole. The limiter's adjustability allows you to dial-in the right amount of front-end lift without wasting power on wheelstands.